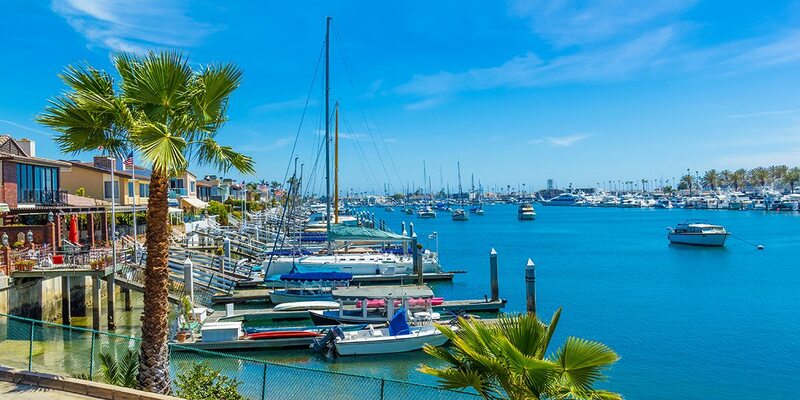 A scenic and affluent city wrapped around a 21-square-mile harbor area, Newport Beach is both a lovely residential community and a dynamic recreational destination. Located on the Orange County coast, with eight miles of ocean beach, the city houses a population of 85,287 (2010)—a number that can easily double in the busy months of summer—as well as some 4,300 boats in the West Coast’s largest recreational harbor. The Tongva and Juaneño/Luiseño people had been living in the area for thousands of years before they were visited by European explorers in the 16th century. Jose Antonio Yorba, an officer in the Gaspar de Portolà expedition of 1769, was awarded a Spanish land grant that included Newport along with many adjacent communities. Nearly a century later the population began to grow significantly, with ranching and shipping businesses attracting new residents to the region. After the shipping industry was established at the San Pedro Harbor in 1899, Newport Beach changed its focus to tourism and recreational boating. Its appeal as a destination was enhanced with the completion of the Pacific Electric Railway from Los Angeles. Newport Beach incorporated as a city in 1906. Newport Harbor was created when the Newport Bay estuary was dredged in the early 1900s. Artificial islands were constructed in the bay and are now covered with private homes: Newport, Balboa, Little Balboa, Collins, Bay and Harbor islands, as well as Lido Isle and Linda Isle. The city is divided into ten named districts, most along the shore and harbor, with Back Bay and the Airport District pushing inland. Much of Upper Newport Bay is a protected natural area known as the Upper Newport Bay Ecological Reserve. In addition to its colorful yachting/boating scene and many water-based recreational options, its quality schools, charming boutiques and delectable dining, Newport Beach is known for its annual eight-day Newport Beach Film Festival and the Orange County Museum of Art, with its large collection of California artworks from the early 20th century to present.